leaning back with mouth open? I have an AV system I'm happy to donate as a prize. Monitor Audio Mass 5.1 speaker system and a Yamaha amp plus the speaker stands. Prefer it to stay together as a system. Alternatively I have some speaker cables which would be easy to carry. PM'd, Wayne, but I'll add in thread that I'll be happy to sell tickets from my room too. I'm going to see about anything I can donate when I get a minute. I have a boxed Isotek Evo3 Premier mains lead I would like to donate to the raffle - almost unused. I was going to donate it as a new item to last years raffle, but it was borrowed by a Wammer who had forgotten his own mains lead. It hasn't been out of the box since, so all the foo and magic should be intact. not even run in eh? Some good prizes are being donated,It has the makings of another successful raffle for this very worthy cause. Sorry I have to say I shall not be able to help this year as I shall be in NZ sorting the family home . Next year you have a volunteer unless I exhibit and you may have a helper in my Missus!! Have a great show:nuts: which I really am unhappy to miss. BAH BAH.!! That is a shame Rod, I was looking forward to a pint and a natter. Enjoy NZ though. Nearly forgot about this,will make it over the weekend. 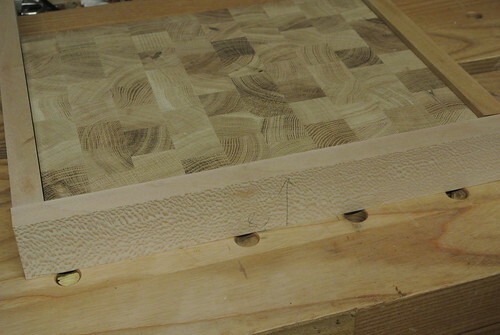 Oak end grain and Lacewood frame for some Wammer's kitchen. Lenco Heaven will be servicing a standard Golding Lenco 75 on the Saturday, and this will be donated to the raffle. On Sunday the GL75 will be available in the Windsor room for playing duties, so that people can have the opportunity to hear the prize.